Trans+ve (Trans Positive) meets in the Equity Centre, every second Thursday of the month from 6 – 9 pm. The group is for any person identifying as Trans, or who may be questioning their gender identity. The aim is to enable and empower Trans to be themselves wholly and confidently. The group also works with local organisations to secure a voice for Trans communities in the district at a strategic and policy level within local public and statutory sector organisations. To share knowledge and information through peer support. To raise awareness amongst members of their rights and how they can influence services. To provide a social space. To provide an environment which encourages good health and wellbeing. 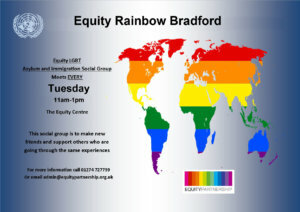 For further information please email Finn at finn@equitypartnership.org.uk. Details of the next meeting can be found here.